Simply burn to a CD, and boot! You can start Installer anywhere inside your Mac! This BootCD IS VERRY helpful when you have Boot problems . Remove the previous one before Running the Programme! Intel, Apple, Oracle, Chameleon, rEFIt and Xom. Easiest and Simplest App That Let You Make Your Own Mavericks Installer From App Store - Retail Mavericks!! I've created A BootCD with the bootloader Clover v2 rL1050 ;its very useful and Powerfull ! Now with this BootCD , instalation of Mountain Lion is like a charm ! Windows users can restore Mac OS X Installesd.dmg image file to a USB Flash Memory/HDD using Transmac (v10.2 and higher) or Virtual Machine (Free VirtualBox) and boot with the BootCD and install OS X to their computers. follow my -2- video on how to use . Slice, with help of Blackosx, dmazar, jadran, Kabyl, STLVNUB, usr-sse2, pcj, pene, FrodoKenny, skoczy, apianti, ycr.ru. Intel, Apple, Oracle, Chameleon team, rEFIt and Xom. Support HFS+, Fat32, GPT EFI !. the kernels is RC4 by Bronzovka. Is best AMD Kernel at the moment. 3.SSSE3 issue has already been solved. Thanks to InsanelyMac Forum . BIG Thanks to Bronzovka !! kalyway, AzimutZ, blackosx, ErmaC, scrax, JrCs . Don't want to install Windows to run HWMonitor to grab sensor info for your board? This is a bootable CD ISO made with BartPE, Windows XP, and CPUID HWMonitor v1.23. 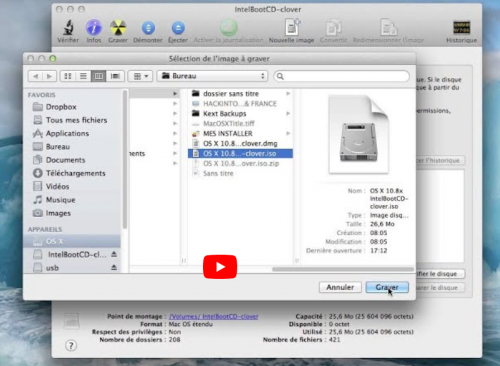 Use OS X Disk Utility to burn to a CD. Why a CD, not USB? I'm lazy and making a USB is a lot more steps. This is Rescue CD who Cannot Boot Their System..